SearchExpress is affordable document scanning software that is so easy to install and use that you can rapidly deploy it in one department, or across your entire enterprise, without costly on-site assistance. For invoices (and forms) SearchExpress uses Google machine learning AI to train itself to automatically recognize different vendors and to automatically extract the data on the invoices and pass the data to your ERP system. In addition to searching and approving documents from your desktop PC, you can access scanned documents and other digital documents from your iPad, iPhone, or Android. This means you can access your scanned documents and other digital documents wherever you are, including client sites and field offices. SearchExpress provides speech recognition to let you search and annotate documents and complete eForms using speech, instead of typing, which can be particularly handy when using a mobile device. "The ease of use and versatility of SearchExpress has greatly reduced research cost and storage cost. We have archived more that 850,000 documents to date and our ability for company-wide retrieval and distribution has allowed us to save time and streamline our document production. It has easily paid for itself within the first year. "We are very happy with the product." Jim Ray, Manager of I.T. SearchExpress document scanning software lets you capture, index, route, search and manage your scanned documents as well as your digital documents. 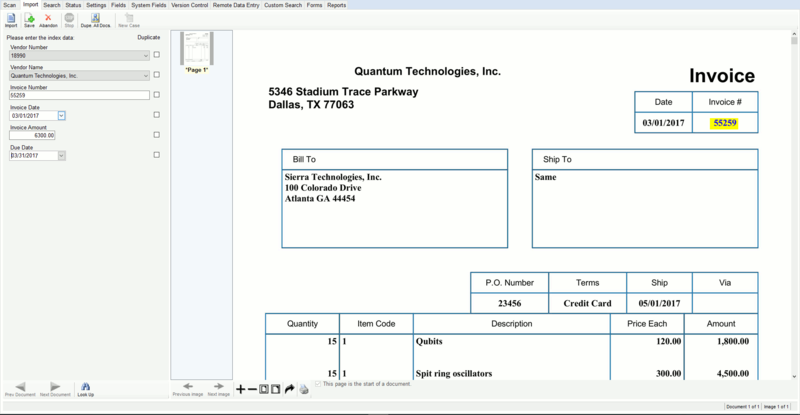 You can automatically index scanned documents using barcodes, Zone OCR, or reading the fields from other computer applications. You can scan documents with any TWAIN compliant scanner, or use an MFP copier. You save emails, Word and other Office documents directly to SearchExpress from your browser, without printing or scanning them. SearchExpress is easily integrated with your existing business-critical applications so you can share data with your other applications and view your scanned documents and other digital documents from your other applications. You can search by typing in a word or phrase. Also, you can search by highlighting a search word or phrase in your CRM, ERP or other applications, and pressing a function key. SearchExpress is enterprise document scanning software that organizes your scanned documents and other digital documents in compliance with legal regulations, in a secure document repository. SearchExpress document scanning software provides search and document workflow to automate business processes and ensure people have the information they need, at the time they need it. SearchExpress eForms lets you replace paper forms. You can fill out, route and approve eForms from your browser. SearchExpress provides the information you need to quickly respond to customers and employees and to make better and quicker decisions. For document scanning software search features, click here.